Irishman claims he could have retired after Floyd Mayweather fight but he came back "for the love of this"
Conor McGregor returned to UFC, a bottle of his own whiskey in hand, by labelling opponent Khabib Nurmagomedov a "coward" in a furious tirade. In July, McGregor was sentenced to five days of community service in the United States after pleading guilty to disorderly conduct following an incident in which he hurled a metal dolly at a bus in which Nurmagomedov was sat. McGregor said the Russian would be "dead right now" if he had stepped off the bus. 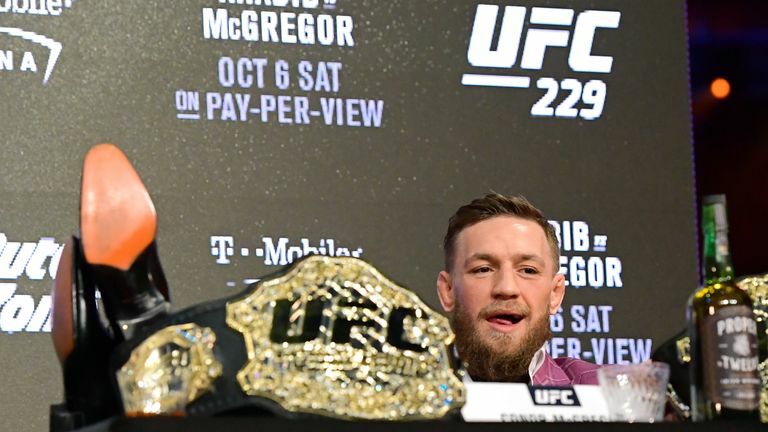 The pair face off when McGregor returns to the UFC octagon for the first time in almost two years on October 6 in Las Vegas. Nurmagomedov holds the lightweight title McGregor was stripped of due to inactivity. "I came back for the love of this, to come and shut this man up - a little rat, a little weasel, a little hard man in groups," said McGregor. "A man who grows in numbers but on his own and when confronted in a similar situation, cowers away. "To let him know I came unarmed. Step off the bus. You talked the big game, now I'm here. "He done nothing. He sat and hid and cowered behind women and caused what happened to happen. "I just thank the Lord Jesus Christ that that man had not got the balls to step foot off that bus, or that the bus door did not open, because if that bus door had opened, this man would be dead right now. Nurmagomedov claimed to be the "Floyd Mayweather of MMA" in a jibe at McGregor's venture into boxing last year. He was defeated by former five-weight world champion Mayweather, but earned more than £450m from the fight. "I don't have to fight for money no more, I have made so much," said McGregor. "Don't get me wrong, I could have retired from the boxing. "I am set for life, I don't have to be here. I am here to enjoy this. I am going to love putting you out of your misery and stomping on your head." After McGregor's press conference UFC president Dana White revealed the Irishman had signed a new six-fight deal with the company. White said the agreement could make McGregor the most money in sport.